Ducati adds extra cc to the hugely successful middleweight Panigale. 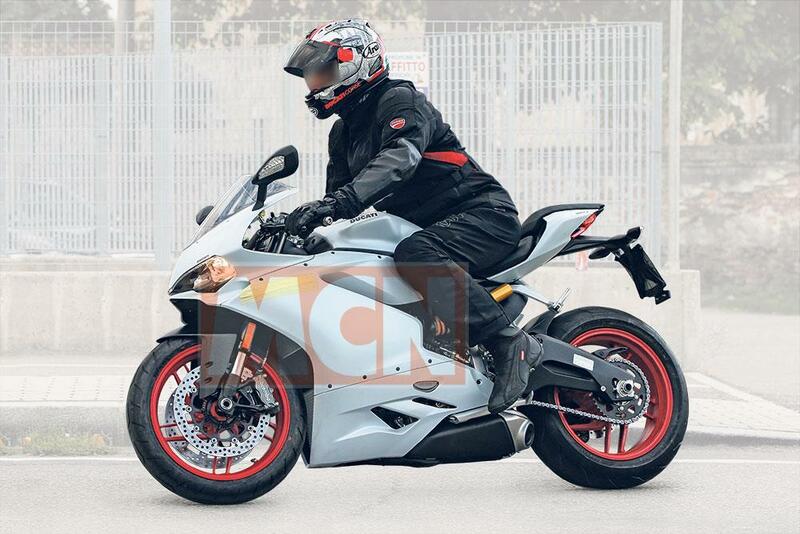 This is the heavily revised 2016 Ducati 959 Panigale, spied last week undergoing final testing ahead of its unveiling in Milan, and pre-Christmas launch. Ducati’s planned update for the 899 Panigale was confirmed last week by documents lodged with the California Air Resources Board (CARB). The documents confirmed that the new bike’s engine capacity will be 955cc, and that it will be called ‘959 Panigale’. The changes to the bike are completely true to MCN’s prediction, and bring the new 959 in line with the recently revised 1299 and 1199R Panigale. These changes include a wider front fairing, which used to be offered as an option on the 1199 Panigale, but is now standard. The seat unit is now reshaped, as are all the side-fairing panels, and the exhausts. The 57cc boost sees the old 898cc 899 Panigale giving way to the new model for the new year, with bikes expected to be in dealers by Spring. The 899 has been a fantastic sales success for Ducati, attracting a significant number of new fans into the Ducati family, and striking an incredible balance of power and handling. While there’s a degree of fear that the capacity hike could upset that balance, there’s no doubt that the chassis can cope with a little more power and torque, and it seems inevitable that Ducati will continue to use their class-leading electronics to aid control and delivery. Many 1199 Panigale riders baulked at the idea of trading up to a 1299 Panigale, claiming that the 1199 was more than enough – but Ducati have thoroughly cracked the ‘control’ nut, making the 1299 the fastest and easiest Ducati superbike of all time. The chances of them not repeating the feat with the new 959 seem very slim indeed. The new 959 Panigale will be just one of nine confirmed changes to the Ducati range in 2016. The other expected models include the Monster 1200R, two new Hypermotards with an SP version at the top, a Hyperstrada, Diavel Carbon, Diavel ‘Custom’ with belt-drive to replace the chain drive and a more feet-forward riding position, a larger capacity Scrambler, and a Pikes Peak edition of the Multistrada 1200 DVT.